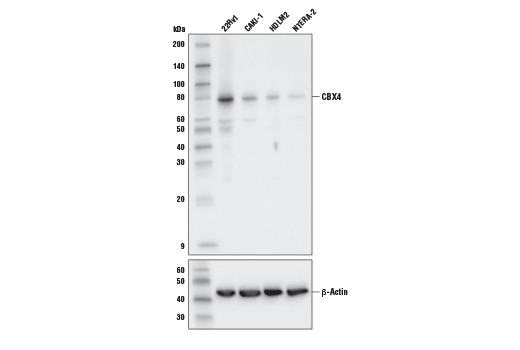 Western blot analysis of extracts from various cell lines using CBX4 (E6L7X) Rabbit mAb. As expected, HDLM2 and NTERA-2 cells do not highly express CBX4. Immunoprecipitation of CBX4 from MCF7 cell extracts. Lane 1 is 10% input, lane 2 is Rabbit (DA1E) mAb IgG XP® Isotype Control #3900, and lane 3 is CBX4 (E6L7X) Rabbit mAb. 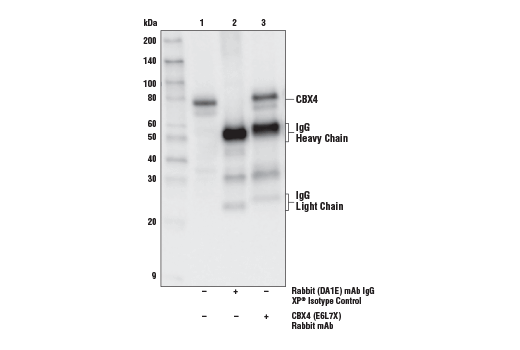 Western blot analysis was performed using CBX4 (E6L7X) Rabbit mAb. 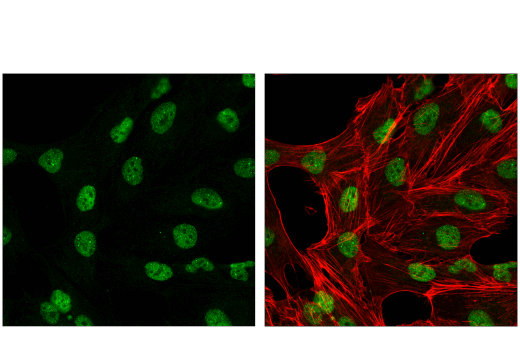 Confocal immunofluorescent analysis of Caki-1 cells using CBX4 (E6L7X) Rabbit mAb (green). Actin filaments were labeled with DyLight™ 554 Phalloidin #13054 (red). Samples were mounted in ProLong® Gold Antifade Reagent with DAPI #8961 (blue). Chromatin immunoprecipitations were performed with cross-linked chromatin from NCCIT cells and either CBX4 (E6L7X) Rabbit mAb or Normal Rabbit IgG #2729 using SimpleChIP® Plus Enzymatic Chromatin IP Kit (Magnetic Beads) #9005. The enriched DNA was quantified by real-time PCR using SimpleChIP® Human HoxA1 Intron 1 Primers #7707, SimpleChIP® Human HoxA2 Promoter Primers #5517 and SimpleChIP® Human α Satellite Repeat Primers #4486. The amount of immunoprecipitated DNA in each sample is represented as signal relative to the total amount of input chromatin, which is equivalent to one. 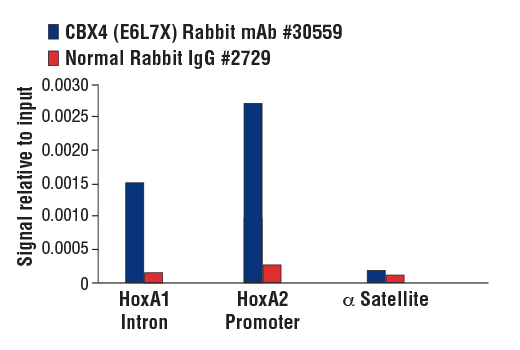 CBX4 (E6L7X) Rabbit mAb recognizes endogenous levels of total CBX4 protein. Monoclonal antibody is produced by immunizing animals with a synthetic peptide corresponding to residues surrounding Pro166 of human CBX4 protein. The polycomb group (PcG) proteins contribute to the maintenance of cell identity, stem cell self-renewal, cell cycle regulation, and oncogenesis by maintaining the silenced state of genes that promote cell lineage specification, cell death, and cell-cycle arrest (1-4). PcG proteins exist in two complexes that cooperate to maintain long-term gene silencing through epigenetic chromatin modifications. The first complex, EED-EZH2, is recruited to genes by DNA-binding transcription factors and methylates histone H3 on Lys27. This histone methyl-transferase activity requires the Ezh2, Eed, and Suz12 subunits of the complex (5). Histone H3 methylation at Lys27 facilitates the recruitment of the second complex, PRC1, which ubiquitinylates histone H2A on Lys119 (6). CBX4 is a component of the PRC1 complex, which together with Ring1 strongly enhances the E3 ubiquitin ligase activity of the Ring2 catalytic subunit (7,8). CBX4 itself is a SUMO E3 ligase, and its function influences EMT, DNA damage response, tumor angiogenesis, and self-renewal (9-13). Satijn, D.P. et al. (1997) Mol Cell Biol 17, 6076-86. Cao, R. et al. (2005) Mol Cell 20, 845-54. Kagey, M.H. et al. (2003) Cell 113, 127-37. Li, B. et al. (2007) Biochem J 405, 369-78. Ismail, I.H. et al. (2012) Nucleic Acids Res 40, 5497-510. Li, J. et al. (2014) Cancer Cell 25, 118-31. Klauke, K. et al. (2013) Nat Cell Biol 15, 353-62.